No matter what sport you coach or at what level of competition, good communication is essential. While most coaches recognize this fact, it can still be a challenge to get everyone on the same page. So what can you do to improve your team’s communication skills? Let’s take a look at some of our best tips. If you’ve got something to say to your team, you have to determine the best way to say it. Of course, the “best way” is going to vary depending on your audience. 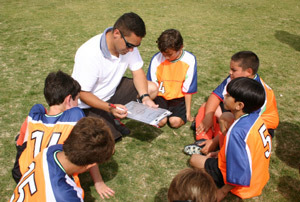 For example, your demeanor around your players is probably going to differ from your demeanor around the parents. And your demeanor around certain parents might be different still. The best way to determine how to effectively communicate with your team members is to get to know them. Find out what style of communication they respond to best. Some players need direct, no-nonsense communication, while others prefer a calmer conversation. Figure out what works best for them, and then stick with it. Though it might sound a little counterintuitive, you don’t always need to talk to get a point across. In fact, gestures and facial expressions are sometimes more descriptive than words ever could be. Before you take a vow of silence, just remember that non-verbal actions can also be negatively expressive. For instance, when a player continues to take bad shot after bad shot, you might start to feel like throwing your hands up in frustration. Resist that urge! If a message isn’t received or is quickly forgotten, it wasn’t much of a message. Luckily, technology makes it easier to send messages—and ensures that they’re saved for reference later. With our handy-dandy TeamSnap Live! feature, for example, you can send instant updates to everyone with just one push. Last-minute rainout? Players need rides to the game? Renegade herd of cows took over the field? There’s no faster way to let your team know than with TeamSnap Live! It’s available on our free mobile apps for iOS and Android, so there’s really no reason not to download it. Remember, a team that communicates is a team that has fun!